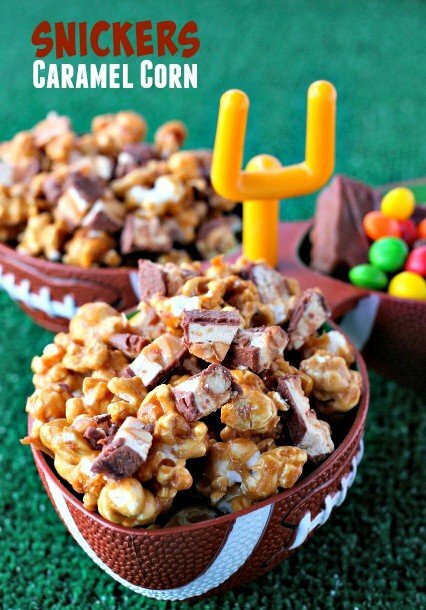 We’re getting ready for the Big Game around here, so we need the food going…let’s start with some SNICKERS® Caramel Corn for snacking on! Watching sports on TV at my house is pretty much an every day thing. Every day that sports games are on anyway. I love watching with my two boys or friends that stop over. The wife and I start the day talking about what we’re going to cook up – from dinner (or lunch, depending on what time the game is on) to appetizers and dessert. 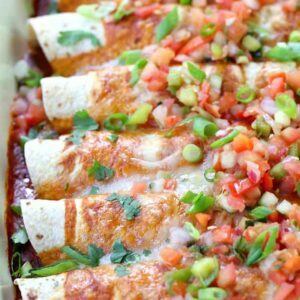 Spicy foods like wings or buffalo chicken dip are always on the menu but we try to make a few things that the boys will like snacking on too. They eat pretty much anything but spicy wings are usually a no-go. First I popped up some fresh popcorn and got my SNICKERS bars ready. Then I made a quick caramel sauce, poured it over the popcorn and stirred it all together. Already this is a winner. I could have stopped right there and it would be awesome. But we’re going to add some SNICKERS to make it even better! Spread your caramel corn out on a sheet pan and bake in the oven for 45 minutes, stirring it every 15. When the caramel corn comes out start chopping up your SNICKERS bars. You don’t want to put them on when the popcorn first comes out of the oven – give it about 15 minutes to cool and then put on the chopped SNICKERS. You want the SNICKERS to stick to the caramel corn but not melt all the way. Now get ready for bowls to be empty. The caramel corn is buttery and chewy and almost every cluster has a piece of snickers stuck to it. 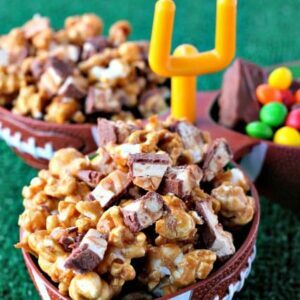 This SNICKERS Caramel Corn will definitely become one of your (and your kids) favorite Game Day snacks! Heat up the oil in a large, heavy bottomed pot over medium heat. Add in the popcorn kernels and cover. Grab a hot mitt and shake the pot back and forth once the popcorn starts to pop. Once it’s all popped, careful not to let it burn, turn the heat off and remove your popcorn to a large bowl. 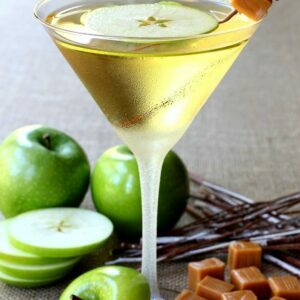 Now you can start your caramel sauce. Add the butter, brown sugar, vanilla, salt and corn syrup to a medium sized pan. Cook over medium heat, stirring often, until the butter and sugar are completely melted. Cook for 5 minutes until it almost comes to a boil. Carefully add in the baking soda, stirring so that it doesn’t boil over. 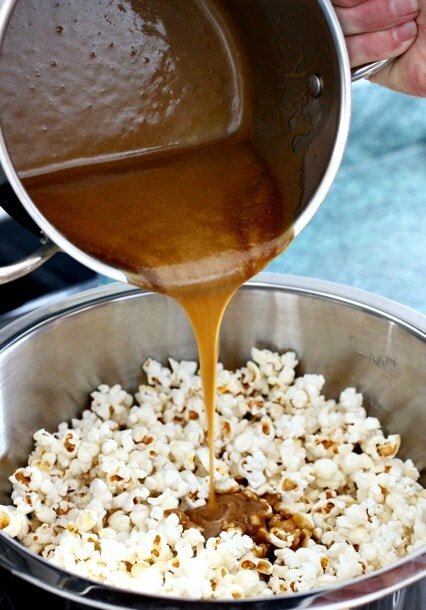 Pour the caramel sauce over the popcorn and stir so that all the popcorn is coated. Bake in the oven for 45 minutes, taking out to stir every 15 minutes. 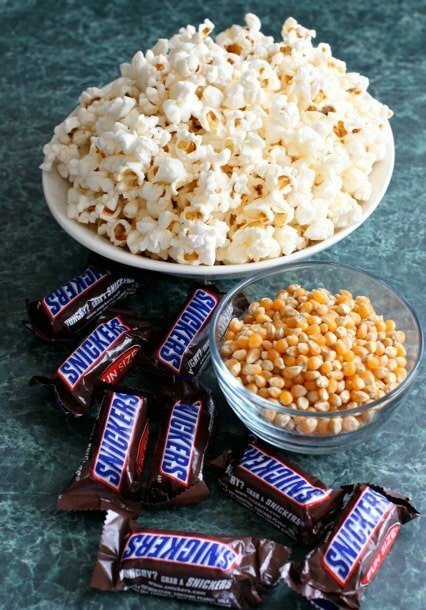 Add your chopped Snickers candy bars all over the top of the popcorn and let sit for an hour. The chocolate will melt slightly and stick to the caramel corn, but then you want to give it time to cool and harden again. 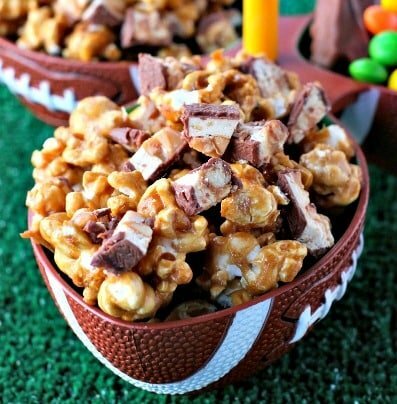 Break the caramel corn into pieces and serve. This is some supremely awesome snack food right here! 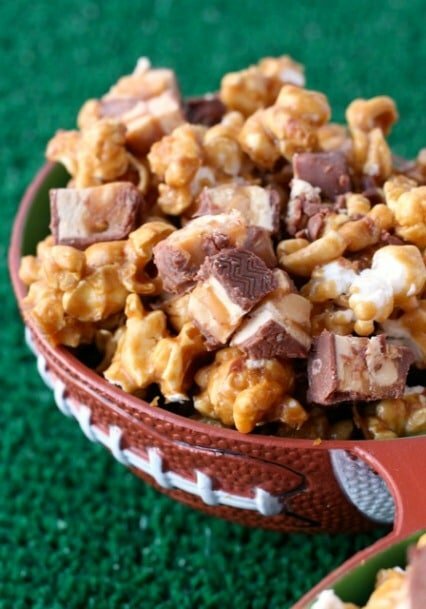 Oh my goodness, I’m crazy for caramel corn and Snickers so I am going to need a big bowl of this pretty soon. It was my first time making caramel corn and it wasn’t too hard! Definitely try it…it didn’t last long here! Thank you! It went over pretty good around here!